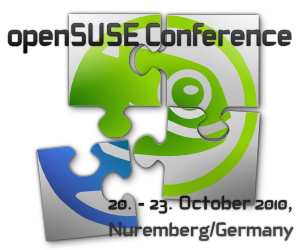 Artwork and banners for the openSUSE Conference. Please leave them as they are. 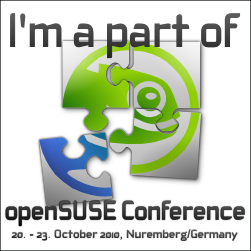 Altering the graphics in any way dilutes the recognition of openSUSE graphics. Do not change the logo. Do not change any letters in the logo to a different font, casement, form or color. Do not italicize, skew or stretch the logo. Do not deviate from the spacing or sizing relationships already established in the logo. Do not use unauthorized icons or words in conjunction with the logo. 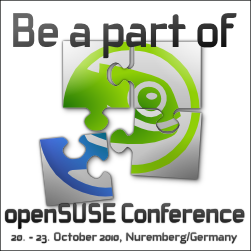 Use the openSUSE graphics only in conjunction with pieces related to the openSUSE.org project. They should not be used in any other instance. This page was last modified on 19 July 2011, at 20:54.